Partly cloudy skies. Low 36F. Winds light and variable..
A screen shot from Will Deschamps Sr. Facebook page on Tuesday. 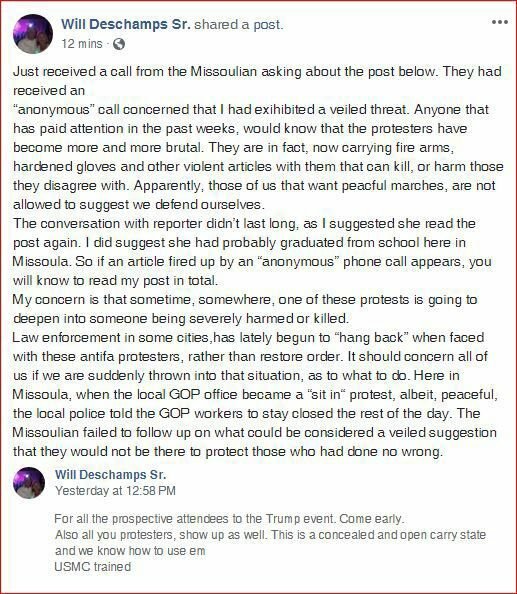 On Wednesday, after being contacted by a Missoulian reporter, Will Deschamps Sr. added this post to his Facebook site. A Facebook post by a former state Republican chairman appears to be urging people to bring guns Thursday to Missoula’s Trump rally. But Will Deschamps Sr. says he’s only suggesting that people be ready to defend themselves against armed “antifa” who may be present. In a short telephone interview, Deschamps, who led the Montana GOP from 2009 to 2015, said his post wasn’t any kind of veiled threat, but he is concerned about the far-left antifa, also known as anti-fascists. Last weekend, melees broke out in New York and Portland between members of the antifa and the far-right Proud Boys nationalist men’s club. Both groups condone political violence. According to the Washington Post, cell phone videos in New York showed a person “writhing on the sidewalk while several men take turns kicking him” during a confrontation between the two groups. It noted that officers spotted pepper spray, hard-knuckled gloves, firearms, batons, and knives at the Portland fight between the two groups, but didn’t specify which group had which weapons. “It should concern all of us if we are suddenly thrown into that situation, as to what to do,” Deschamps wrote. Erin Erickson, director of Missoula Rises, which is organizing the Love Trumps Hate “get out the vote” counter protest to the Trump rally, called Deschamps postings “irresponsible” and concerning. She said they plan to meet Trump’s “divisive and hateful rhetoric” with an outpouring of community, love, support, grace, collaboration and action. “On Thursday, we intend to radiate love and action throughout our state,” Erickson said in a press release. She’s been involved in numerous protest marches throughout Montana, including the Women’s March in Helena that drew 10,000 people, and said she’s never experienced any violence. Still, Erickson is working with both the police and sheriff’s departments in Missoula to try to provide safe and constructive events. Brenda Bassett with the sheriff’s office said both departments are beefing up patrols within city limits and at the airport venue in order to keep the peace. Bassett said they’re aware of Deschamps’ posts, and have “forwarded it to the appropriate parties.” Local law enforcement are working closely with the Secret Service, which focuses on protecting the president. But she said the only concerns they had heard about the potential for violence were in Deschamps' post. She couldn’t say whether security measures would keep people from carrying concealed weapons into the Trump rally. It is slated to begin at 6:30 p.m. at Minuteman Aviation near the airport. Some protesters are expected to attend that event. A representative from the Missoula County Republican Central Committee didn’t return a phone call seeking comment on Deschamps posting. Mary Ann Gillispie plans to be at the airport at 8 a.m. sharp Thursday — a latte in hand — to be sure she gets to see President Donald Trump.